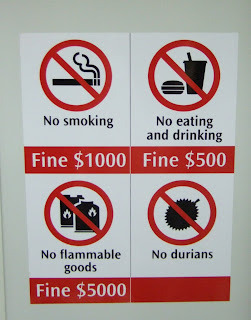 First of all, what is a durian? It is an imposing-looking tropical fruit native to Southeast Asia, where it has been crowned the "King of Fruits," and rightfully so. Certainly there is no other fruit like it anywhere - it is capable of inspiring both passionate devotion and utter revulsion. The fruit announces its presence with a strong and pungent odor that is simultaneously fruity sweet and rotten and oniony. This smell alone is enough to turn away many, and is strong enough that in some Southeast Asian countries, durian have been banned from public transportation and hotel rooms. So why even bother with this ugly and noxious smelling fruit? 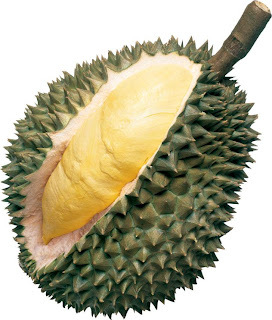 Once cut open, the durian yields soft fleshy insides that have an almost indescribeable but exquisite flavor - a smooth, refreshing and delicious tropical custard, but with a hint of an underlying strong flavor, that some have likened to onions, and others to almonds. Certainly, durian tastes like no other fruit on the planet. And I should point out that it is an acquired taste - while one person may become a devotee for life, a second person may be turned off at their first taste. It is, however, the sort of thing that everyone should try once - if you like it, the rewards are quite great. That being said, the mere smell alone may be enough to deter some people, and there is nothing that can really be done about that. Durian can be bought at Asian groceries either as a whole fruit or in frozen portions. Buying a whole fruit can be expensive and, I have been told, it is extremely difficult to know if your fruit is properly ripened. An over-ripe durian may be much more offensive than a properly ripened one and can make a very bad first impression. For the purposes of this recipe, it may be best to go with frozen, which should not have ripeness issues. The following is a cheesecake recipe that features durian prominently. This is admittedly not a particularly complex or refined cheesecake recipe - the goal was to come up with a simple, no-bake recipe that allowed the deliciousness of the fruit to take center stage. However, ultimately it produces a very decent cheesecake, made even tastier with addition of the durian. Additionally, I took the shortcut of using pre-made pie shells which is because I ran short of time and did not want to be wrestling with crusts - however, if you want to make your own crust, there are hundreds of cheesecake recipes online that will instruct on making a crust and, if desired, using a springform pan to make an actual cake, rather than a pie. This recipe will make two pie-size cheesecakes, or one 8-inch cake. If you are serving to people who are unfamilar with durian, my suggestion is to make a pie which will yield smaller slices - you can just halve this recipe for a single pie. Beat the sugar and cream cheese together with electric beaters until fluffy. Puree the durian flesh, then beat into the cream cheese and sugar mixture. Heat the water in a small bowl until boiling or near boiling, then add gelatin grains and stir until dissolved. Stir into the durian mixture. In a separate bowl, beat the whipping cream until you have soft peaks, don't overdo it. Gently fold the whipped cream into the durian mixture until blended. Pour the mixture into the crusts and spread to the edges. Refrigerate at least four hours or until the mixture sets firmly. Some of my test-tasters were of the opinion that the flavor improves slightly over time, so don't hesitate to make it a day or two ahead. Also, feel free to decorate/garnish it however you like - but keep in mind that some flavors may not mesh well with durian. I found one recipe that adds a fudge layer on top of the durian layer. This might taste delicious, or it might not. But I would consider giving it a try on my second go-round of making this recipe, which I will most certainly be doing. Matt, I know conventional wisdom says it stinks, but we were in Southeast Asia a year ago and found that not always to be the case. It depends on the ripeness of the fruit. It is delicious and the adventurous will love it.